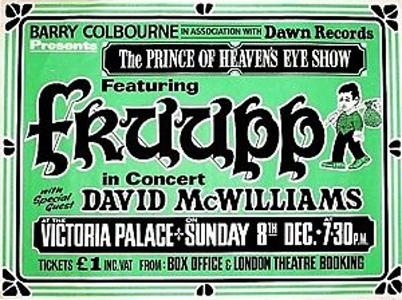 Fruupp were a progressive rock band from Belfast active in the Seventies. Despite gigging extensively in Ireland and the UK - and Europe - and regularly supporting bigger names like King Crimson, the band never really broke through. Their four albums for Dawn Records are now highly regarded. They contain classic progressive rock comparable to Genesis and Yes-inspired bands like Druid, Asgard and England. They tends towards the lighter side of prog, with folky, classical and baroque passages, acoustic guitars, vocal harmonies and occasional use of oboe, but the music is also laced with heavier electric guitar and organ passages. Fruupp were assembled in Belfast in 1970 or 1971 by mainman Vince McCusker (born 3.10.1949 in Maghera, Co.Derry). There were a number of lineup changes in the beginning, involving early members such as Ian 'The Beast' Best (bass), Trevor Davis (bass), Marty 'Capone' O'Connor (drums) and Rob McCulloch (rhythm guitar), before the familiar lineup. The band debuted at the Ulster Hall in Belfast on the 23rd June 1971, supporting Rory Gallagher amongst others. After a few dates in the UK Miles McKee left and Peter Farrelly (born in Belfast in 1949) took over the lead vocal duties. The band gigged regulary through 1972-73 and eventually signed a five year deal with Dawn Records, the progressive arm of Pye, circa July 1973, the same year they played a famous concert at Liberty Hall in Dublin. The debut album Future Legends was released in September 1973. It was originally to have included the track On A Clear Day which is based on a theme by Holst, but the copyright holders refused to clear it and so the track had to be removed. A replacement track Graveyard Epistle was recorded in time for the LP's release. The band played two free concerts during their summer 1974 tour: the Phoenix Park in Dublin and Nutts Corner in Antrim. Two albums were released in 1974, Seven Secrets in April followed by the album that's currently regarded as their masterpiece The Prince of Heaven's Eyes in November. Seven Secrets secured a USA release in August 1974 and a 5-week tour of USA was undertaken in December 1974. At this point keyboardist Stephen Houston (born Belfast 18.7.1953) was born again and decided to leave the band. Some say this was a crucial setback for the band at a time when they were gaining momentum. John Mason joined on keyboards in January 1975 and appears on the final album Modern Masquerades, released in February. The band was still touring this album at the end of the year, during the winter of 1975/76. The Modern Masquerade Show tour kicked off at the Pier Pavilion in Hastings on December 5th, 1975 and took in the Roundhouse, the New Vic in Belfast, Liverpool stadium, the Southend Kursaal and ended at Manchester University on the 7th of February, 1976. Sequel Records released a compilation in 1992 Songs For A Thought which included 'On A Clear Day' which had finally been cleared for release in 1979. Notes: On A Clear Day was originally intended for inclusion but was replaced at the last minute by Graveyard Epistle. It is possible test pressings exist which include the earlier track. Collects tracks from all 4 albums plus unreleased track 'On A Clear Day'. Graveyard Epistle (Future Legends) and Faced With Shekinah (Seven Secrets). Seaward Sunset (Prince of Heaven's Eyes) and Gormenghast (Modern Masquerades).